A BRAVE Dumbarton fightback was not enough to prevent them suffering a 6-3 defeat at the hands of Hibs at the Bet Butler Stadium. A BRAVE Dumbarton fightback was not enough to prevent them suffering a 6-3 defeat at the hands of Hibs in front of a 1,400 crowd at the Bet Butler Stadium. The visitors dominated the first half and went in at the interval 3-0 up thanks to goals from Scott Allan, Dom Malonga and Paul Hanlon. 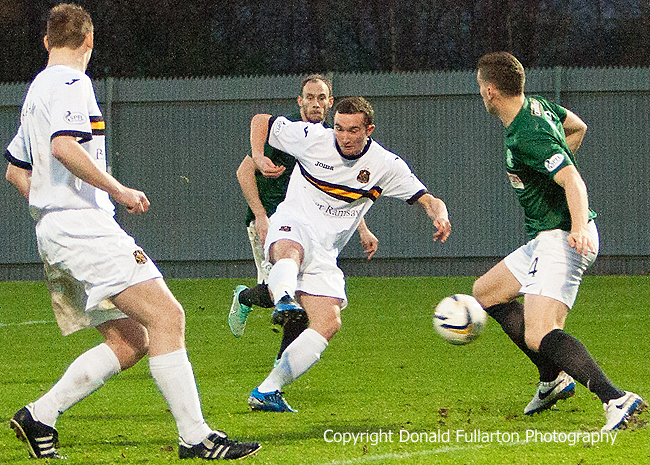 The home side had a few chances, notably through Mark Gilhaney and Colin Nish, but could to make one count. At the start of the second half manager Ian Murray took off defenders Mark McLaughlin and Scott Taggart, and sent on Keiran MacDonald and comeback on loan striker Chris Kane. It paid dividends. In minutes Kane — out for several weeks through injury — scored a fine goal (pictured), latching on to an excellent headed cross from Nish, and he went on to show just how much his pace and energy up front has been missed. It left supporters wondering why he was not played from the start. Soon after skipper Andy Graham made it 3-2 with a floated header from the edge of the penalty box, and a comeback looked possible. But then Malonga struck again to make it 4-2. Once more Sons pulled a goal back, this time with a fine low shot from man of the match Garry Fleming, and home hopes rose again. However further Hibs goals from Sam Stanton and Malonga, completing his hat-trick, ensured Hibs went home with all three points and a margin which did flatter them.